School is important part of kids life. Play school, nursery are foundation of education. Well known Artist, Designer and Painter for 3D Cartoon Wall Paintings in India. 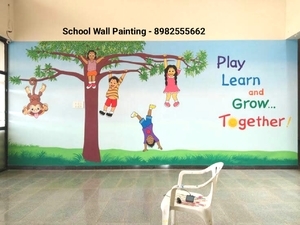 We are specialized in school wall painting, 3d cartoon painting, play school wall painting, nursery school wall painting, Wall painting, Kids room wall Painting, Cartoon painting for kids room. In school they should need happy and enjoyable environment. We do paintings in various school across Madhya Pradesh, Gujaraat, Rajasthan, Maharashtra. Paintings are theme based like Jungle theme, Space Theme, Music Theme, Activity Theme, Learning Theme, Cartoon Theme,, underwater theme, snow theme, etc. The principal of playschools usually asked for creating such wonderful themes in their playschools. Little kids love such paintings as these take them into a whole new world. Because of paintings they come to know about different surroundings that exist in the world or beyond. Our concept is to provide learning environment to the kids through our paintings. These paintings create an aura of happiness among the children. The designer walls attract the children to such craft work and keep them glued.